As one who knows the grief of a pregnancy aborted and attempt after unsuccessful attempt at conception, I wasn’t surprised to receive a NY Times piece on the topic from a half-dozen people. It’s no wonder The Japanese Art of Grieving a Miscarriage has hit a nerve: our dominant culture in the US has little willingness to see this face of grief. As I read her moving account of how dressing and watching over their own Jizo provided structure and solace to their mourning, the story rang a bell. Several years ago I’d heard a radio account of a mizuko kuyo ceremony using Jizo statures conducted at a Zen monastery not far from my home. The primacy of the experience of the grieving parents is largely what’s depicted in the NY Times piece – the author describes looking for something “to take the edge off my grief” and likens the Jizo to pouring calamine lotion over the itch of her sadness. 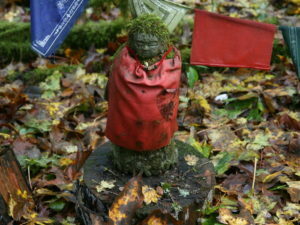 At the Great Vow Monastery in Clatskanie, Oregon, filled with hundreds of Jizo statues from dozens of mizuko kuyo ceremonies over the last 20 years, voice is given to the feelings of the mizuko by one participant. The idea that life is suffering is one of the essential truths of Buddhism. And seeing that laid out so plainly — especially for losses that are usually so private — can actually bring people some peace. The American mizuko kuyo, at its heart, isn’t about Jizo statues or chants. It’s about compassion — for the losses we suffer, for everyone around us and for the lives all of us are living. The grieving parents, and not-to-be-parents, of our world need and deserve compassion, absolutely. And how much better to tend to the suffering of the grief-stricken with ritual – whether private as described in the Times or collective as in the NPR story – than the Percocet the Times author was offered. But perhaps the greatest gift of this practice from Japan is the idea that it’s not, after all, just about us – that compassion is not limited to the living human world that seems, too often, to be the exclusive focus of our cultural concern. I trust that June Comeau will see this, so apropos of her entries on Elegant Sorrow. This item brings back to me the story of my mother and father’s pain over the miscarriage of the child that was to have been their firstborn. And also the story of yet another stillborn child when I was five – and wondering why my mother was still in some hospital somewhere. I will forward it to my younger daughter, whose first pregnancy ended in an early miscarriage. She and her partner are now the parents of my six-year-old grandson – and the stories go on. Thanks, Diane, for sharing your family’s stories across several generations, which point to the impact on siblings, too, of the children who aren’t born or don’t live out their childhoods. You’ve brought to mind my maternal grandmother’s miscarriages before immigrating from Italy to this country where her children were born Americans in the early days of WWII… how much different the family path might have been had those first pregnancies not ended as they did….